Waterbed decking is the unseen, unheard, and unthought of part of a waterbed. It is the platform on which your waterbed bladder lies and that makes it one of the most important parts of a wood framed waterbed. Decking is usually made of 7/16 OSB oriental strand board or ½ plywood. Over the years here at STL Beds we really like using 7/16 OSB because it’s easier to work with, typically cheaper to buy, and most importantly stronger. Over the our many years of installing and disassembling and moving we have found that the plywood tends to warp and bend with age and is very hard to straighten out. Wafer board or OSB can usually be flipped over and will slowly flatten back out. It is very important to have a good support system under the decking of your waterbed which every type of decking you choose to go with. Make sure when you are assembling a hardside waterbed that you have equal overhand on all sides of your pedestal. Water bed decking is usually cut to 85 inches in length to accommodate the notch cut into most end boards of the frame. If no bottom notch is present on the two frame end boards then the wood decking will need to be cut at an 84-inch length. Many waterbed companies sell the decking in two foot wide pieces. A Super Single would use two 24-inch pieces, California King would use 3 two foot pieces, and a Queen would use two 2 footers with a one footer in the middle. California King we opt to use one 48 inch and one 24 wide x 85 inch long piece. California Queen again we eliminate a seam by utilizing a 36 wide and 24 inch wide x 85 inch long piece. Finally the super single we eliminate all seams in the deck by using one 48 x 85 inch piece of OSB. This unique way of selling our customers decking adds lots of extra strength to your waterbed frame and reduces possible hazards like accidentally installing the heater over a crack or seam, which you should NEVER do. Some final notes always crop or dog-ear the decking corners at the headboard end to run your waterbed heater cord and sensor through if you are using one. If you are using OSB install with the waxed side up. It is more resistant to water damage and there are virtually no splinters. 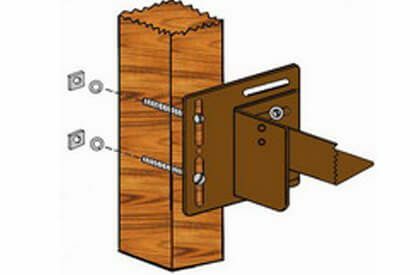 Due to overcut by the saw you will have a ½ to ¾ gap if you are using 3 pc decking on your king or queen bed. Don’t panic, when they are laid out spread them out so you have several ¼ inch gaps instead of one big one. 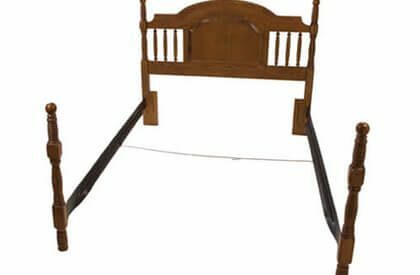 Finally one of our most important recommendations, don’t be chintzy with the angle waterbed brackets or L Brackets they are less likely to pull loose and will last for many years, whether you are of average size or considerably heavier. What would you suggest a person use to increase the efficiency of a waterbed heater? I understand I shouldn’t place anything on the top side of the decking other than the heater pad, safety liner and waterbed mattress, but find the radiant heat loss down into my pedestal drawer unit unacceptable. Can I safely apply a radiant barrier foil product such as Ra-flect on the underside of my waterbed’s decking to reduce this energy waste? In order to stop radiant heat transfer is a simple reflective/radiant barrier product (a thin sheet of reinforced aluminum foil) superior to a reflective foam insulation product when used between the pedestal and decking? What’s your take on energy efficiency and waterbed heating? 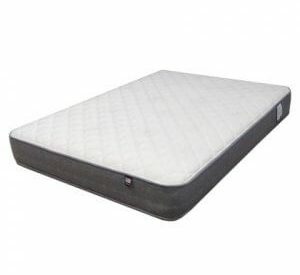 The best thing you can do to increase waterbed effeciency is a zipper quilted mattress cover like you find on softside waterbeds. Most of your heat is lost through the surface of the bed. You can also keep the bed covered using a good mattress pad, sheet set, and bed spread. An energy efficiant solid state heater would be a great investment if you currently are operating with an old bulb and cap type waterbed heater. As far as safely applying a radiant foil barrier foil product on the underside of the decking to reduce this energy waste I see not harm in that. Like you said no placing anything on top of the waterbed heater other than the liner, mattress, and a zippered cover designed for such a purpose like I just mentioned. Thanks for your response! I may have to look into adding a zippered mattress pad to my waterbed. As far as placing a radiant heat barrier UNDERNEATH the waterbed decking, my research tells me radiant heat barriers need at least a 5/8″ AIR GAP to do its thing efficiently… so it would not do any good to place it directly UNDER the decking. Actually it would decrease the “R” rating due to accelerating convection rather than impeding radiant heat loss like I’d thought. 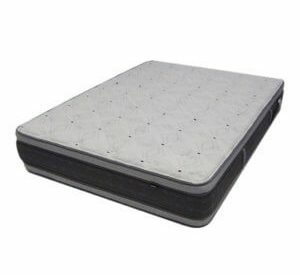 Love the site… it has the best waterbed info I’ve found on the web! Keep up the good work!